I’ll be postng previews of each team individually, but I’d like to write a bit of an introduction to the course and the competition in this post. This year’s Ryder Cup is at the Centenary Course at Gleneagles Resort in Scotland. This course normally hosts the Johnnie Walker Championship on the European Tour (it has been omitted from the schedule this year to prepare for the Ryder Cup). This year’s event comes on the heels of two consecutive one point European wins – to survive an American comeback in Wales in 2010 and to accomplish their own enormous comeback at Medinah in 2012. Overall, the Americans have won just twice, both on home soil, in the eight most recent events, though their recent form has been better than the three early 2000s beat-downs. This year the Americans enter the event missing perhaps three of their five best players (Tiger Woods, Steve Stricker, and Dustin Johnson) and face-down a full strength European team with World #1 Rory McIlroy. Betting odds heavily favor the Europeans to win or retain the Cup at around 67%, and while I think that understates the US chances, they’re certainly underdogs going abroad. The Centenary Course at Gleneagles is a resort course, perhaps with more tooth than normal, but still completely familiar to professionals who play on both sides of the Atlantic. This is certainly not a links style course. This article suggests it is set-up in PGA Tour style with even levels of rough and pristine fairways, not the wild rough or pine straw that we’re accustomed to seeing in the Open Championship courses. That doesn’t favor either side, but this is certainly a course which will play conventionally. In recent Johnnie Walker Championships the course hasn’t shown much of a bite. Fairways hit have been around 66% and GIR% around 67%, both marks would rank as fairly easy on the PGA Tour. It’s played to around the par of 72 on average in recent seasons, though it will play easier for the far superior Ryder Cup players, and so much will come down to how Paul McGinley chooses to set it up will factor hugely into how it ends up playing this weekend. Looking at individual holes, in alternate shot (8 matches) the course splits up very well for teams with one aggressive long hitter and another who hits their irons well. The player who tees off on #1 (players alternate teeing off) will hit eight drives and have three opportunities to go for the green in two on par 5s. The other player will hit only six drives and one second shot on a par 5s, though they’ll have an advantage in long and medium iron shots of nine to three over the first player. This set-up is tailor made to arrange pairings that emphasize a player’s talents and hide their weaknesses. I’ll talk more about some ideal pairings to exploit this in the individual team previews, but it’s definitely something to keep in mind. Home advantage is often alluded to in Ryder Cup discussions, but not in a precise manner. There’s some advantage to playing in front of more supportive crowds for sure, but there’s no doubt that both sides make themselves heard no matter the location of the event. More important is the simple effect of traveling to compete on another continent and adjusting to the local time zone. Professionals golfers definitely have to face travel issues all the time, but Europeans who play on the European Tour surely face it more often as they travel between Asia, the Middle East, North America, and Europe. As a contrast, most Americans on the PGA Tour leave North America only twice to compete – the Open Championship in Britain in July and WGC-HSBC in China in November. To attempt to quantify the disadvantage of playing away from ones home continent I set-up a study using 2013 & 2014 data. I split all players’s performance data into three groups – United States, Western Europe, and elsewhere – and discarded the elsewhere group. I then weighted each group of data based on the harmonic mean between the number of USA rounds and Western Europe rounds (for example, Patrick Reed had 81 USA rounds and only two Western Europe rounds for a harmonic mean of 3.9). I divided the players up into three groups – Americans who played on the PGA Tour, Europeans who played mostly on the PGA Tour, and Europeans who played mostly on the European Tour (almost no Americans played mostly on the European Tour). I didn’t take into account where players currently live, only their birthplace. I then calculated the performance of each group, weighted using the harmonic mean, in USA rounds and Western Europe rounds. The results were shocking. European players who play on the PGA Tour suffered no penalty moving between Western Europe and the USA. They had identical performances. European players who play on the European Tour lost about 0.5 strokes in performance between Western Europe and the USA. Americans on the PGA Tour lost around 0.5 strokes in performance between the USA and Western Europe. This suggests that the penalty for Americans who play the PGA Tour going to Europe is about equal to the penalty suffered by Europeans going to the US. At first I was worried that a lot of this had something to do with Americans who hardly play links golf coming over to play the Open Championship. In fact, 40% of my sample only played in Western Europe for the Open Championship. I tossed out the Open Championship rounds which yielded a penalty of only 0.2 strokes for Americans playing in Western Europe, but the sample of rounds is fairly small. I’ve chosen for the rest of this post to simply average my original penalty with this non-Open Championship penalty and say Americans suffer approximately a 0.35 stroke penalty when traveling to play in Europe. Here’s an important caveat though. 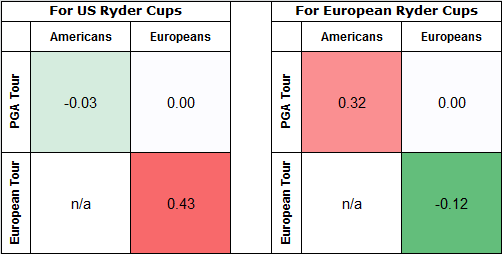 A rating based on aggregate performance (like mine) already has some of this travel penalty mixed into the Europeans results because more than half of the rounds for Europeans who play on the European Tour come away from home – Asia, the Middle East, and the US. In comparison, almost none of the rounds for Americans who play on the PGA Tour come away from the US. Adjusting for this produces the below chart. All that means at least half of the Europeans suffer no penalty moving between US Ryder Cups and European Ryder Cups, while the other half suffers similarly to Americans traveling to a European Ryder Cup. The entire American team suffers an enormous penalty going across to play in Europe, but gets no advantage from playing on home soil. In short, for US based Cups, the US team has an advantage of about 0.2 strokes – equal to a 52-48 edge in a generic match – while, for European based Cups, the European team has an advantage twice that size (0.4 strokes) – equal to a 54-46 edge in a generic match. In fact, if this home advantage holds for the earlier years (and I’m guessing it does as European players have consistently had to travel more, and particularly travel for major events in the US, in the last at least 20 years) it explains much of Europe’s dominance of this event. Going back to 1997, Europe has won 56% of points at home and 52% in the US – almost exactly what we’d expect give the above HFA. The Americans typically have a slightly advantage in talent – maybe 0.1-0.15 strokes per match or 1% per match – but the Europeans benefit from double the home field advantage of the Americans. Applying home advantage to this Cup, I’d estimate that on average the European teams will be around 0.4 strokes better than the American teams without considering talent. This is enough to start Europe out at 54% to win a generic match. I’ll talk about talent in the team previews and, of course, team strategy may give one side a slight edge. Richie Hunt wrote a great article about potential US captain’s picks a month ago and in it laid out a few statistically informed ways to approach the Ryder Cup. I don’t agree with all of his points, but #4 & #5 about tailoring players for the formats that fit their games is very important. Richie wrote “Four-ball format is about birdies”. Absolutely. On a normal hole, PGA Tour pros are split with about 20% birdies, 16% bogeys, and 64% pars. In a four-ball format where each team has two balls the chance of both players on the other team making bogey on a generic hole are only ~3%. That means par will almost never win a hole; you need birdies. Every golfer has their own distribution of birdies/pars/bogeys; more aggressive players make more birdies/eagles, but also more bogeys, while more conservative players make fewer birdies, but also avoid making bogeys. Both strategies are seen among elite players, but only the more aggressive player is rewarded in four-ball. Both captains would do well to make sure they get their more aggressive players out in these sessions. Richie’s other point was that alternate shot is about avoiding bogeys (each team only has one ball and so pars win holes more often) and pairing players who play similarly. You don’t want to pair someone who’s wild off the tee (Phil) with someone who’s much more comfortable playing off the fairway (Furyk). Also important, as I wrote above, is matching players based on the shots they’ll be hitting. One player in each pairing this year will hit two extra drives and two extra par 5 approach shots, while the other player will hit six extra iron shots. You don’t want to pair your two best iron players or two most aggressive, long hitters with each other because you’ll be wasting one of them on shots they don’t excel at. I’ll talk more about a few of the ideal pairings in each team preview.